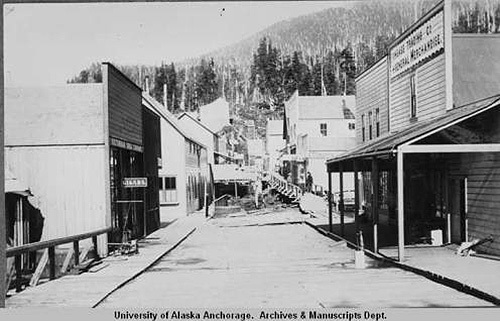 Ketchikan, Alaska - Back in 1900, shortly after Ketchikan was incorporated as a city, the place was a mess. It may have earned the new title of “Incorporated City,” but it certainly did not look like one. It looked more like a frontier outpost with a few wooden saloons and store buildings and scattered shacks. Muddy footpaths barely wide enough for a handcart or wheelbarrow ran here and there against a backdrop of newly-cut stumps and towering trees. A ramshackle cannery emitted a smoky haze that drifted over the harbor and waterfront. In those early days most people hauled their water from Ketchikan Creek, using buckets. You can imagine the problem with this, especially in late summer and fall when the salmon spawned and died along the creek banks. And then there was the problem of fire prevention—or lack thereof. With wooden structures heated with wood- or coal-burning stoves and lit by sooty oil lamps, residents lived in constant fear of fire. Into this mess stepped a man named John Collinson Barber, who had come to Alaska from the Black Hills of South Dakota. He’d graduated from college with a degree in civil engineering in 1895 and then put his education to work at Lead, South Dakota doing something he loved—surveying mines and promoting the mining industry. View of the town of Ketchikan, Alaska. Photograph taken between 1890 and 1910. Julia Willma Weber papers, Archives and Special Collections, Consortium Library, University of Alaska Anchorage. While living in South Dakota, Barber met and married his wife Nellie and in 1900 the couple traveled to Juneau, where he worked as a mining surveyor. In 1903 he was offered a job as manager of the Golden Fleece Mine at Dolomi on Prince of Wales Island. He accepted the position but due to previous debts and court cases filed by creditors, the mine failed. The Barbers moved to nearby Ketchikan, which was fast becoming the hub of the mining industry in southern southeast Alaska. The rapidly-growing town needed utilities, especially water, power and light—and the sooner the better! Several local citizens, including Barber, organized and incorporated a company called the Citizens Light, Power & Water Company (CLP&WCo). 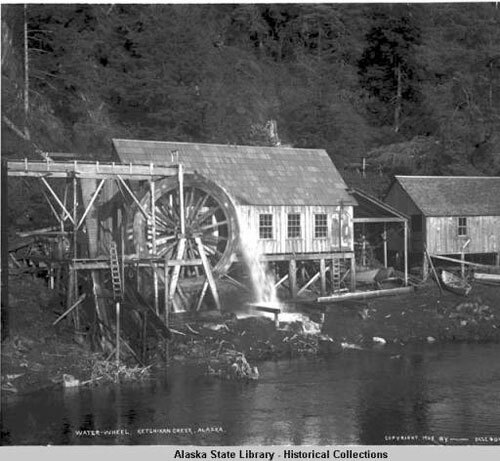 In December of 1903 the new company bought out another small utility, thereby acquiring water rights on Ketchikan Creek, some primitive equipment, flumes and pipelines. From this small but auspicious start CLP&WCo charged ahead and began building a dam on the creek about a mile from tide water. But a competing utility from Juneau had other ideas, such as gaining water and power rights for themselves. The Juneau interests filed an injunction, which stopped all work and development on the creek. This infuriated not only Citizens Light, Power & Water but all Ketchikan residents, who had to go without power for months while the senseless legal case dragged on! When the case finally went to trial and was settled in favor of Citizens, the company resumed work on the dam, built a nearby power house with a water wheel and a 60 KW generator, and installed water mains from the power house to the town center. Water-wheel - Ketchikan Creek, Alaska. 1905. Collection Name	William R. Norton. Photographs, ca. 1890-1920. 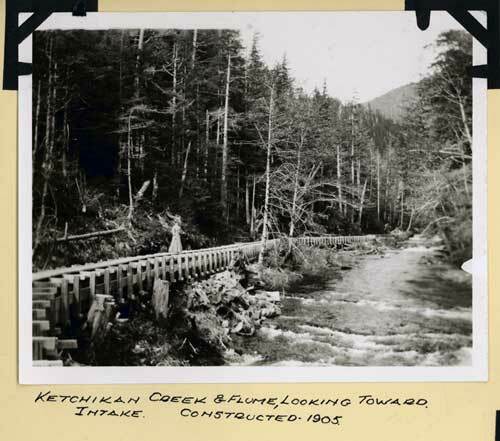 In early 1905 Barber assumed the role of company president, took new surveys and filed for additional water rights on Ketchikan Creek. 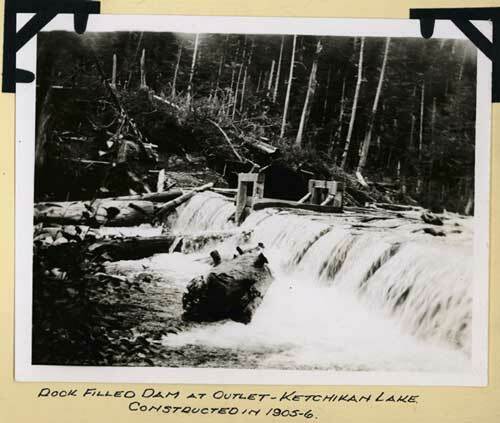 CLP&WCo then constructed a rock-filled dam at the outlet of Ketchikan Lake, excavated a tunnel and added 3300 feet of flume. 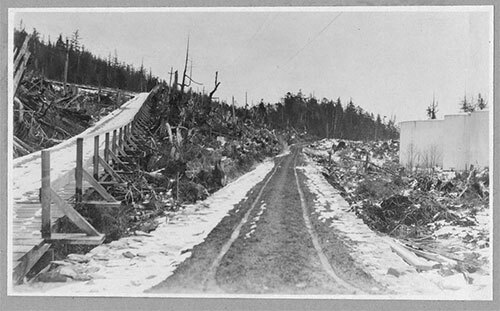 As progress continued, a 75-foot-long dam was built on Ketchikan Lake No. 2. In 1910 Barber obtained a franchise from the Town Council for telephone service. He traveled south to inspect the latest in automatic phone systems, ordered a central switchboard from Chicago and soon put a crew to work installing telephone poles and lines. Appraisement, Citizens Light, Power & Water Co. In 1912 near the corner of today’s Park and Fair Streets, the company constructed a new concrete power house with a water wheel and 2300-volt Westinghouse generator. The next year the new plant was fitted with two Morgan Smith turbines and two 600 KW General Electric generators for a total capacity of 1200 KW. Pleased with progress and life in Ketchikan, John and Nellie Barber bought and settled into a new two-story, bungalow-style home at the top of Main Street. They participated in many of the town’s social affairs and activities, including the newly-formed Ketchikan Shrine Club, of which Barber was a charter member. He was also a charter member of the Ketchikan Rotary Club, and he served on the Town Council and as president of the Ketchikan School Board. During this time he also kept up with his first love—mining. In 1908 he and two other businessmen, Henry C. Strong and C.H. Black, bought a group of mining claims known as the It Mine located near Kasaan, according to Patricia Roppel in her book Fortunes from the Earth. The three men incorporated the It Mining Company, developed the claims and began copper ore production. Barber served as general manager of the mine, which of course meant spending much time on the Kasaan Peninsula and away from Ketchikan. Still, he loved the work and managed to keep up with both the mine and CLPW&WCo. Under his leadership, the mine workers constructed a mile-long tramway, an 1100-foot wharf and two 1300-ton ore bunkers, then produced and shipped $150,000 worth of ore! In late 1912, however, Barber fell ill—and finally seemed to realize he could not do everything. He and his partners sold the mine. By the time WWI began Barber had recovered his health and he and his wife both joined the Ketchikan chapter of the American Red Cross. He served first as chairman of the Military Relief Committee, then as chairman of the entire Ketchikan Chapter. Nellie worked behind the scenes, sewing and knitting garments and preparing and serving food. As a fledgling company in a fledgling town CLP&WCo faced numerous problems and challenges. During the winters, water mains and pipes often would freeze, leaving the town without power for days and weeks at a time. During the summers creeks would run low or dry up completely, causing limited power or none at all. And other systems malfunctioned too, namely that of the sewer, which often backed up, ran over and sent sewage running down the streets! The nascent telephone service also needed continual attention and improvement. As residents and businesses clamored for more and better phone service, Barber again traveled south to research the latest technology. After his return, in 1917 the company installed what was then called a “Harmonic Selective Ring Telephone System,” which improved the “ring method” for party-line customers and allowed them to hear a ring for their own calls but not those of their neighbors. From 1920 to 1923, Citizens Light, Power & Water struggled to keep up with the town’s constant need for more power. The company improved the Ketchikan Lake reservoir system and power house, increasing capacity to 2600 KW. It also took surveys and developed plans for an additional power supply—that of Charcoal Creek and Carlanna Lake. If anything, Barber was a man who wasn’t afraid of hard work and financial risk. In 1913, he decided to increase his holdings and, together with several friends and businessmen, started a cold storage business. His new plant, appropriately named the Ketchikan Cold Storage Company, provided ice and bait to fishing boats and boxing and freezing facilities to fish buyers. Constructed on the corner of Front and Grant Streets, the company’s first building had a storage capacity of two million pounds of fish. In 1921 they expanded, adding a 30-ton ice tank, an 1800-ton ice storage room, a mild-cure storage room and two additional fish storage rooms. On July 8, 1923 the Ketchikan Alaska Chronicle reported that two large warehouses had been built and more dockage space added. By 1926 another addition was completed, bringing the total plant capacity to more than seven million pounds. As if serving as president and manager of two large successful businesses wasn’t enough, Barber and his friend, Henry C. Strong, and other stockholders incorporated a real estate business called the Home Land Company. 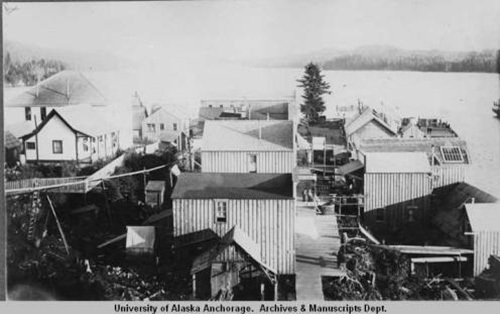 According to the Ketchikan Alaska Chronicle (October 9, 1925), the new company bought up all the so-called “Schoenbar property,” with plans to develop home sites that could be sold to new residents at reasonable prices. The “Schoenbar property” encompassed 250 acres and extended from Mahoney Heights (Deermount area) to Bawden and Pine Streets, according to the Chronicle. 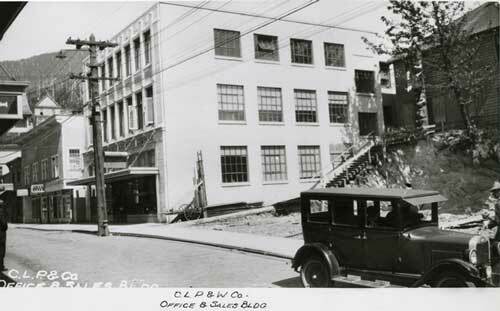 Also in 1925 the newspaper reported that CLP&WCo had begun construction on a new three-story office building on Front Street. Plans for the new building stated that it would house an electrical equipment retail outlet, a multiple-phone system allowing for expansion to 1800 lines, and a large storage area for equipment that had been stored previously in four different buildings around town. 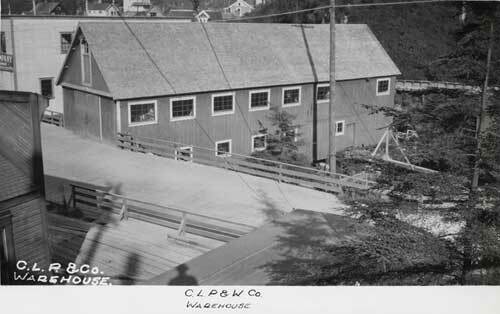 When completed, the concrete building served its purpose and still stands today as Ketchikan City Hall. (The fourth floor was added in 1952). The town continued to grow and demand more power. Barber and CLP&WCo succeeded in developing the Charcoal Creek drainage area, installing a small power house with up-to-date hydroelectric equipment. The town’s electric transmission lines were extended from the U.S. Lighthouse Depot (today’s U.S. Coast Guard base) on the south end to the J. L. Smiley Cannery on the north end. But the growth of CLP&WCo, particularly its partnership with J.C. Barber, was fast coming to a close. Near the end of 1928 an investment company from Minneapolis, W. B. Foshay Public Utilities Consolidated Corporation, came to town, bid on and bought Citizens Light, Power & Water. After the purchase, the Foshay interests took over management of both the Citizens Light, Power & Water and the Ketchikan Cold Storage—at which point, after 26 years of service with Ketchikan’s utilities, Barber resigned. Shortly thereafter he and Nellie sold their home on Main Street and rented an apartment in Seattle. They returned to the First City to spend the summers of 1929 and 1930, taking care of business and visiting friends. That second summer, however, was the last they ever saw of the town where they’d lived for at least the last 26 years. They spent the next several years traveling, then settled down in California to enjoy their retirement. Footnote: Within a few years of purchasing Citizens Light, Power & Water Company, the Foshay Corporation from Minneapolis filed for bankruptcy. 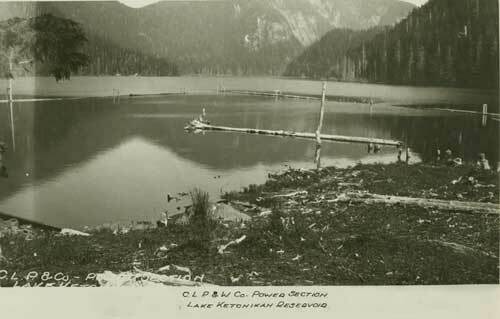 In 1935, after several years of public haggling and controversy, the City of Ketchikan bought the Citizens Light, Power & Water Company, which then became the Ketchikan Public Utilities that we know today. Ancestry.com. U.S. Federal Census: 1910, 1920, 1930, and 1940. Brown, Ericka. “A Tradition of Service: The History of KPU,” research for the Tongass Historical Museum, 2008. “Dynes’ Alaska Directory and Buyers Guide,” 1630 7th Ave., Seattle, Washington, June, 1920. Report of the Governor of the District of Alaska to the Secretary of the Interior, Washington, Government Printing Office, 1903. Roppel, Patricia. “Fortunes from the Earth: An History of the Base and Industrial Minerals of Southeast Alaska,” Sunflower University Press, 1991. Roppel, Patricia. “Striking It Rich! Gold Mining in Southern Southeast Alaska,” Coachlamp Productions, 2005. The Mining Journal, May 15, 1906. The Ketchikan Alaska Chronicle, cited sources. Whitehouse, John. “Hydroelectric Power In Twentieth Century Alaska: Anchorage, Juneau, Ketchikan and Sitka,” Bulletin of the Institute of Water Resources, Vol. 2, University of Alaska, Fairbanks, 1983.
freelance writer living in Ketchikan, Alaska.